Can anyone help me find what font each of the titles for the film series? Usually typing the film title followed by "font" will lead you to the typeface used for the logo. I did the same thing for some of my fan art, and it worked every time. This was the image in question. Credit to whoever originally posted it. Good on you, @Murdock. I spent at least an hour trying to track that down. The truth is, I started this for @Murdock. I think my favorite is Steadfast. DikkoHenderson Daniel Craig at the plastic surgery clinic- "Gently my friend Gently... THAT'S NOT BLOODY GENTLY!!" I found the image above very helpful but can someone direct me to the names of the fonts in each of the title sequences? Not just the logo but the titles themselves. Thank you Property, for investigating. I'm not turning up much in my own inquiries.. I'm obsessed with movie title fonts and they would be very useful in a personal project. My work has turned up the following. Please note if I'm not totally sure that a font is what I think, I'll get a close match and it will be noted as close. 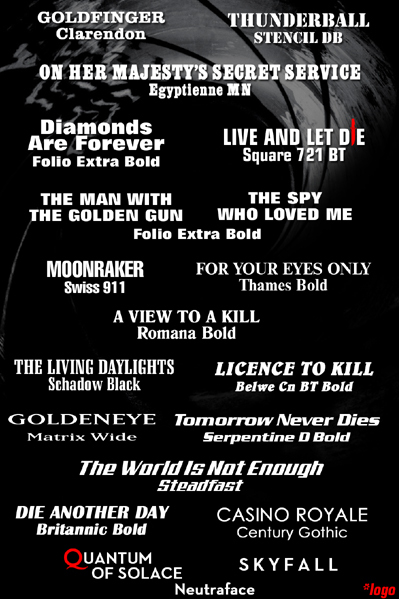 Many (if not all) of the fonts can be discovered by searching the Bond title followed by "font." Yes, but that wasn't what Dikko was looking for. Now I know where the Helvetica Scenario gets its name! Yes, I hadn't seen his post. Thanks. A couple of days ago, I found out that you can get the Archangel Chemical Weapons Facility, USSR font from GE (which I learned is called Marseille Serial) and it can be downloaded for free, completely legal. 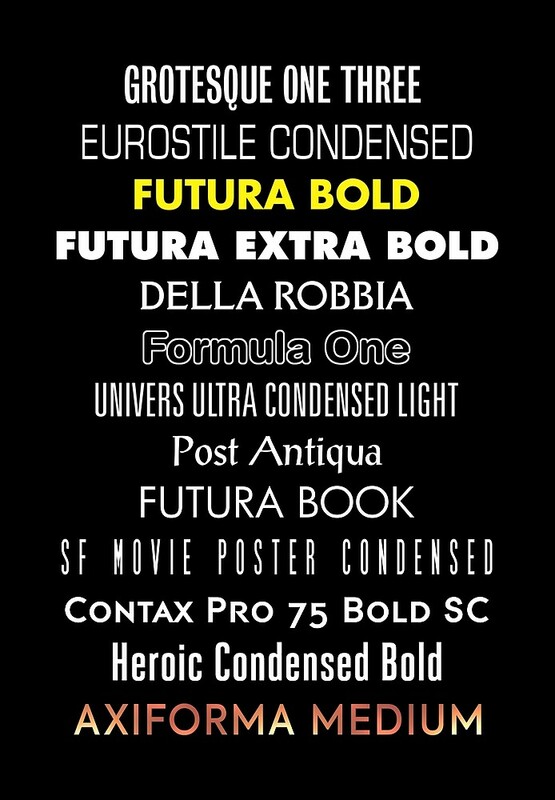 For the Special Editions a lot of the movies use the font Compacta. And FRWL SE uses Grecian-Bold. I like the logo on the Scandinavian comic strip magazine from the 60s/70s. Sorry. Is this it @Agent_99? Thanks, @PropertyOfALady! I'd seen that one and it is excellent - I just like the way the Dr Who design only shows the typefaces, no titles, but nerds will know what's up.